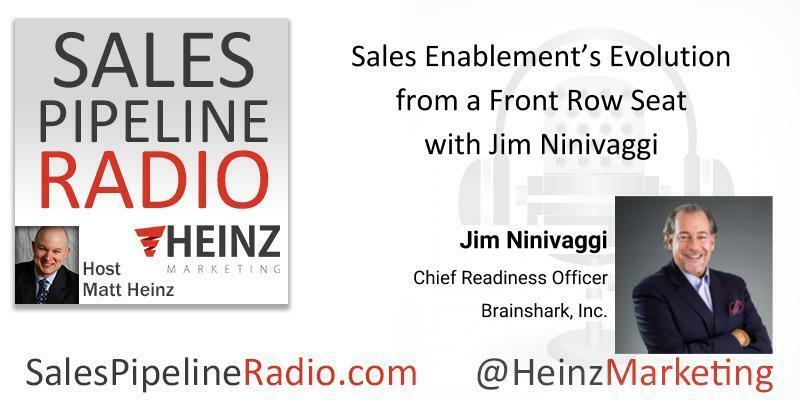 Join us for this episode: Sales Enablement’s Evolution from a Front Row Seat with Jim Ninivaggi,Chief Readiness Officer at Brainshark, Inc.
His front row seat to the evolution of sales enablement. How does it differ from what he saw 6 years ago? The “bifurcation” that is happening and how it is primarily around two key areas of sales enablement: sales readiness and sales content management. We will discuss what this means. We will discuss how this bifurcation is shaping the sales enablement tech landscape. Helping in the management of content. Ensuring reps can use assets effectively in their buyer interactions. Helping ensure lead conversion through better initial buyer conversations. Working hand-in glove with product marketing to ensure reps are ready to position enhancements and new products. We will wrap up by talking about the group that seems always lost in the alignment discussion – first-line managers, and how we need to think about providing assets for managers to use in coaching reps.
More about our guest: Jim is an established thought leader and business analyst from his former role as the head of SiriusDecisions' sales enablement practice. He has researched and presented to business leaders around the world on advanced concepts in optimizing sales talent, maximizing rep productivity, world-class sales leadership and sales enablement technology. Jim has published more than 200 research briefs and engaged audiences at hundreds of conferences, forums and executive presentations.